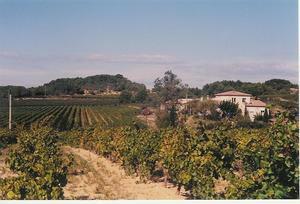 We are winegrowers and offer chambres d'hôtes on our estate where we produce our own "Picpoul de Pinet". In Castelnau de Guers, a small village in the lower Hérault valley, with a view across the hills, vineyards and garrigues leading down to the plain of the river Hérault and an océan of vines. In the grounds surrounding the house we have a private pool and there are botanical paths to explore. Situated inside the house, the main entrance is shared with the owners, each chambre d’hôtes is independent. The suite “les genêts » is upstairs on the first floor and the « Picpoul » room is situated on the ground floor. The Picpoul room has been carefully decorated in the “Louis Philippe” style, with en suite bathroom and wc, a moost comfortable and intimate room opening on to a private balcon y offering a magnificent view across the vineyards of the domaine.